There are many ways to think about how much buying a house costs or how much house you can afford. Considered less often is how many hours of work that money equates to. At least most people don't buy one of those pricey Game of Thrones beers and think, "This beer cost me one hour of work." GOBankingRates has put together those figures for the nation's 25 largest cities. The calculation takes a handful of variables into account, including median home prices, mortgage rates, and median household income in each city. 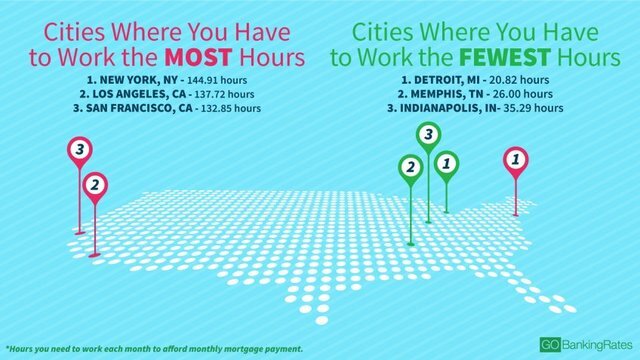 From there, it calculated median hourly pay based on the number of work hours in a year in order to provide how many hours per week you'd need to work to afford a house in these markets. Median prices and not looking at other factors that go into everyday life don't make this a bible of statistical data. However, it provides an interesting look at home prices, and how they correlate to working hours across the nation. From fewest hours to the most, here are the 25 cities ranked. New York requires the most hours, according to Go Banking Rates, because the city has incredibly high home prices (more than three times higher than the national median price) and median incomes that sit below the national average. Detroit is at the other end of the spectrum for many reasons, including having the lowest home prices on the list and a declining population. If you live in a city with totally unreasonable home prices, you might not find solace in your favorite food. Avocado prices are on the rise, and you're going to have to work way too many hours to keep yourself in avocado toast.